The 2004 Democratic National Convention featured a theme for each day of the convention. The first night of the meeting focused on the theme "Plan for America's Future" with speeches devoted to building optimism for John Kerry's candidacy. The second night of the meeting focused on the theme "A Lifetime of Strength and Service" devoted to John Kerry's biography and his path to his nomination. The third night of the meeting focused on the theme "A Stronger More Secure America" devoted to issues of homeland security and the global war on terror. The last night of the meeting focused on the theme "Stronger at Home, Respected in the World" devoted to the overall agenda of the party to secure the borders, improving domestic welfare while at the same time promoting international cooperation in world affairs. The phrase "Help is on the Way" was often repeated by speakers such as John Edwards. The 2004 Democratic National Convention successfully passed an official party platform. A forty-three page document, the party platform was entitled "Strong at Home, Respected in the World" – also the name of the theme conveyed on the last night of the convention. The first part of the platform was called "A Strong, Respected America". The section defined specific goals and actions to defeat terrorism, to keep weapons of mass destruction from the hands of terrorists, to promote world peace and security, to strengthen the military, to achieve energy independence and to strengthen homeland security. The second part of the platform was called, "A Strong, Growing Economy". The section defined specific goals and actions to create what the party called "good jobs" and "standing up for the great American middle class." The third part of the platform was called, "Strong, Healthy Families." The section defined specific goals and actions to reform the healthcare system in the United States, to improve education and to protect the environment. The final part of the platform was called, "A Strong American Community." It stressed the diversity of the nation and the importance of upholding civil rights as a major tenet of the party. 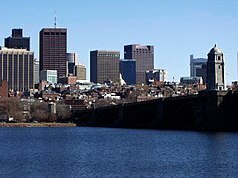 The 2004 Democratic National Convention was the first held in Boston, one of the few held in the home state of the presidential nominee, and also the first since the terrorist attacks of September 11, 2001. During the convention, there was a memorial service to honor the victims of the attacks. Halima Salee, who lost her daughter, son-in-law, and unborn grandchild on American Flight 11, spoke. After an initial notice to 34 cities, 10 cities requested the RFP to host the convention: Atlanta, Baltimore, Boston, Chicago, Dallas, Detroit, Houston, Miami, New York and Pittsburgh. Of those, five cities (Baltimore, Boston, Detroit, Miami and New York) submitted bids, and four cities (not including Baltimore) were visited by the DNC during the site selection process. 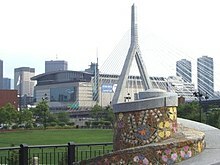 Boston was announced as the host of the convention on November 13, 2002. As a result of the selection of Boston, organizers of the Reebok Pro Summer League had to fold the league into the upstart Las Vegas Summer League due to a lack of lodging in the Boston area. During the convention, U.S. Capitol Police, the U.S. Coast Guard, and other governmental organizations took many security measures to protect the participants of the Democratic National Convention. Security measures included bomb-sniffing dogs, 7-feet high metal barricades, a ban on corporate and private flights at Logan airport, along with the shutting down of Interstate 93. Other Bostonians took advantage of the meeting as a national stage for specific agendas. The police union, for example, gained attention with threats of picketing of delegates from entering and exiting functions – a dilemma for Democrats as the party has traditionally been an ally of organized labor. Having worked without a contract for two years, the police union struck a deal with Boston mayor Thomas Menino for a new contract, avoiding a major embarrassment for the party. State Senator Barack Obama, the Illinois Democratic candidate for United States Senate, delivered the convention's keynote address on Tuesday, July 27, 2004. His unexpected landslide victory in the March 2004 Illinois U.S. Senate Democratic primary had made him overnight a rising star within the national Democratic Party, started speculation about a presidential future, and led to the reissue of his memoir, Dreams from My Father. His keynote address, although not carried by the commercial broadcast television networks, was well received, which further elevated his status within the Democratic Party and led to his reissued memoir becoming a bestseller. As the keynote speaker, Obama set the tone for the party platform. His speech, proclaiming the unnecessary and artificial divides in American culture and politics, was reminiscent of John Edwards's "Two Americas" stump speech: "There's not a liberal America and a conservative America—there's the United States of America." Obama emphasized the importance of unity, and made veiled jabs at the Bush administration and the news media's perceived oversimplification and diversionary use of wedge issues: "We worship an awesome God in the blue states, and we don't like federal agents poking around in our libraries in the red states. We coach Little League in the blue states, and yes, we've got some gay friends in the red states. There are patriots who opposed the war in Iraq, and there are patriots who supported the war in Iraq. We are one people, all of us pledging allegiance to the Stars and Stripes, all of us defending the United States of America." Obama noted his interracial and international heritage: he was born in Honolulu, Hawaii to a Kenyan immigrant father and a white mother from Kansas. He emphasized the power of education, recounting the privilege of attending the exclusive Punahou School and Harvard Law School despite his family's poverty, and criticized the perception that poor black youths who read books are "acting white." He went on to describe his successful career in law and politics while raising a family in Chicago. "In no other country on Earth is my story even possible", Obama proclaimed. Towards the end of his speech, he emphasized the importance of hope in the American saga, and he illustrated how that hope manifested itself in the lives of John Kerry, John Edwards, and even his own personal life, as "a skinny kid with a funny name who believes that America has a place for him too." According to Obama, the "audacity of hope" is "God's greatest gift" to Americans, allowing him to feel optimistic that the lives of average Americans can be improved with the right governmental policies. Following the speech political commentator Chris Matthews rightly predicted "I just saw the first black president". Not yet formally nominated for the Vice Presidency, John Edwards took the stage at the Convention to give the first major national speech of his political career. Delegates raised red-and-white vertical "Edwards" banners and chanted his name. The theme of Edwards's address was the divide between the "two Americas", his populist message throughout the primary campaign and now one embraced by Kerry. He tied the division to his own roots in North Carolina, and introduced his family to the audience. Edwards addressed his parents from the podium: "You taught me the values that I carry in my heart: faith, family, responsibility, opportunity for everyone. You taught me that there's dignity and honor in a hard day's work. You taught me to always look out for our neighbors, to never look down on anybody, and treat everybody with respect." Edwards went on to define the two Americas he claimed to exist, one for the rich and one for the poor, and repeated several times that "It doesn't have to be that way." He called for one health care system, equal in quality to the coverage received by Senators and other elected officials, and promised to establish a Patients' Bill of Rights. Edwards proposed one public school system for all, arguing that "None of us believe that the quality of a child's education should be controlled by where they live or the affluence of their community." He appealed for the end of the two economies, "one for people who are set for life, they know their kids and grandkids are going to be just fine, and then one for most Americans, people who live paycheck to paycheck." Edwards also stated how the Democrats expected to pay for their agenda: "We're going to roll back – we're going to roll back the tax cuts for the wealthiest Americans. And we're going to close corporate loopholes. We're going to cut government contractors and wasteful spending. We can move this country forward without passing the burden to our children and our grandchildren." Many pundits noted that while Edwards's charismatic style was in evidence, he had rushed through the speech, ending several minutes earlier than planned. The delegates in the FleetCenter, however, were enraptured, and Edwards led them several times in a statement-response chant: "Hope is on the way." This, and the general upbeat tone of the address, was a response to attacks by the Bush campaign claiming that Kerry and Edwards were pessimistic and cynical; it was altered and echoed the next day in the more detailed speech of John Kerry: "Help is on the way." John Edwards was chosen by acclamation. Prior to his speech, John Kerry's daughter spoke about her father. After this, a video played, showing highlights from Kerry's life, including his birth in Colorado, his childhood in New England, the travels with his diplomat father to post-World War II Germany, and his service in Vietnam's Mekong Delta, interspersed with clips of Kerry speaking and narrated voice overs. After the video's conclusion, former U.S. Senator Max Cleland delivered a speech proclaiming that the global conflict and active wars in Afghanistan and Iraq required a decorated military hero such as Kerry in the White House. This concluded with Kerry's entrance, where he made a military salute and announced, "I'm John Kerry, and I'm reporting for duty!" Kerry then accepted the nomination for President. Democrats reacted positively to John Kerry's acceptance speech. With Democrats strongly opposed to the Bush administration, John Kerry spent most of his speech appealing to independent voters and to swing voters. He promised to train 40,000 new active duty troops, to implement all the recommendations of the 9/11 Commission, to cut the national deficit in half within four years, to cut middle class taxes while repealing the Bush administration's tax cuts for those making more than US$200,000 per year, to stop privatization of Social Security, and to expand stem cell research. On the day after Kerry's speech, George W. Bush's reelection campaign launched a counterattack on the claims and promises made by Kerry and others at the convention. At a campaign stop in Springfield, Missouri, Bush told a crowd: "My opponent has good intentions, but intentions do not always translate to results", attacking Senator Kerry's record in the Senate. In addition to the Obama, Edwards, and Kerry addresses, there were also speeches from former Presidents Bill Clinton and Jimmy Carter, former Vice-President and 2000 Presidential nominee Al Gore, New York Senator and former First Lady Hillary Clinton, Massachusetts Senator Ted Kennedy, former candidate Al Sharpton, and Presidential Advisory Counsel on HIV/AIDS Denise Stokes. Ron Reagan, son of Republican President Ronald Reagan, also spoke at the Convention, blaming Bush's hijacking of his father's legacy for his switch in support to the Democrats. Polls conducted after Kerry's speech showed no significant increase of support (or "convention bounce") for the Democratic nominee's bid to unseat President Bush. Democrats ascribed the disappointing numbers to an unusually polarized electorate that year with few undecided voters, though Bush did get a small bounce out of his convention. Presidential candidate Dennis Kucinich speaks out against the Iraq War. 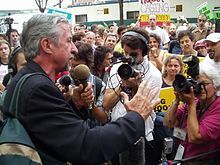 Tom Hayden urges anti-war activists to continue efforts to organize. There were a number of demonstrations during the 2004 Democratic National Convention. Protesters included members of the Bl(A)ck Tea Society, a group of self-described anarchists, who opposed the war in Iraq. Approximately 400 members of the Bl(A)ck Tea Society marched through Boston's financial district and headed toward the fleet center, where they set fire to an effigy that showed George Bush on one side and John Kerry on the other. That evening a group of peace activists held a peaceful rally a few hundred feet from the FleetCenter. Local Boston politicians were joined by presidential candidate Dennis Kucinich and long-time activist and California state senator Tom Hayden in a call to end the occupation of and to remove U.S. troops from Iraq and to bring in an international peacekeeping force. Also, Hayden and Kucinich called on anti-war Democrats to support John Kerry against George Bush in the general election. The largest protest was held on the Sunday evening before the convention was set to start. An estimated 2,000 anti-war members marched at the same time as approximately 1,000 anti-abortion activists, and the two groups crossed paths en route to the convention center. The following day, this anti-abortion group had its permit revoked to protest outside of the Kerry family home. They challenged the decision, but it was upheld by a federal judge, who sided with the Secret Service in determining that the protest would be too close to Kerry's home, potentially endangering the presidential candidate. ^ "2004 Democratic Convention Speakers List". Archived from the original on November 14, 2007. Retrieved May 15, 2007. ^ "Elections 2004 - Rounding Up The Democratic Convention". Moderateindependent.com. July 30, 2004. Retrieved September 4, 2013. ^ Webb, Cynthia L. (July 26, 2004). "Democrats Get Wired in Boston". Washington Post. Retrieved May 15, 2007. ^ "Site Selection 2004". GWU. Retrieved January 13, 2009. ^ Christovich, Amanda (July 19, 2018). "How NBA's inaugural Vegas Summer League was kick-started by the Democratic National Convention". USA Today. Retrieved February 15, 2019. ^ a b "Security details: dogs, guns, choppers – politics | NBC News". MSNBC. July 25, 2004. Retrieved September 4, 2013. ^ a b Greenhouse, Steven (June 30, 2004). "Democrats Fear Boston Police Union May Picket During Party Convention". The New York Times. ISSN 0362-4331. Retrieved May 5, 2018. ^ Mendell, David (March 17, 2004). "Obama routs Democratic foes; Ryan tops crowded GOP field; Hynes, Hull fall far short across state". Chicago Tribune. p. 1. Retrieved September 13, 2012. Davey, Monica (March 18, 2004). "As quickly as overnight, a Democratic star is born". The New York Times. p. A20. Retrieved September 13, 2012. Howlett, Debbie (March 19, 2004). "Dems see a rising star in Illinois Senate candidate". USA Today. p. A04. Retrieved September 13, 2012. Scheiber, Noam (May 31, 2004). "Race against history. Barack Obama's miraculous campaign". The New Republic. pp. 21–22, 24–26 (cover story). Retrieved September 13, 2012. Finnegan, William (May 31, 2004). "The Candidate. How far can Barack Obama go?". The New Yorker. pp. 32–38. Retrieved September 13, 2012. Dionne Jr., E.J. (June 25, 2004). "In Illinois, a star prepares". The Washington Post. p. A29. Retrieved September 13, 2012. Scott, Janny (May 18, 2008). "The story of Obama, written by Obama". The New York Times. p. A1. Retrieved September 13, 2012. Mendell, David (August 14, 2007). Obama: from promise to power. Amistad/HarperCollins. pp. 235–259. ISBN 978-0-06-085820-9. ^ . (August 2, 2004). "Star power. Showtime: Some are on the rise; others have long been fixtures in the firmament. A galaxy of bright Democratic lights". Newsweek. pp. 48–51. Retrieved September 13, 2012. Samuel, Terence (August 2, 2004). "A shining star named Obama. How a most unlikely politician became a darling of the Democrats". U.S. News & World Report. p. 25. Archived from the original on December 6, 2008. Retrieved September 13, 2012. Lizza, Ryan (September 2004). "The Natural. Why is Barack Obama generating more excitement among Democrats than John Kerry?". The Atlantic Monthly. pp. 30, 33. Retrieved September 13, 2012. Davey, Monica (July 26, 2004). "A surprise Senate contender reaches his biggest stage yet". The New York Times. p. A1. Retrieved September 13, 2012. Leibovich, Mark (July 27, 2004). "The other man of the hour". The Washington Post. p. C1. Retrieved September 13, 2012. Milligan, Susan (July 27, 2004). "In Obama, Democrats see their future". The Boston Globe. p. B8. Retrieved September 13, 2012. Seelye, Katharine Q. (July 28, 2004). "Illinois Senate nominee speaks of encompassing unity". The New York Times. p. A1. Archived from the original on June 24, 2006. Retrieved September 13, 2012. Broder, David S. (July 28, 2004). "Democrats focus on healing divisions; Addressing convention, newcomers set themes". The Washington Post. p. A1. Retrieved September 13, 2012. Bing, Jonathan; McClintock, Pamela (July 29, 2004). "Auds resist charms of Dem stars; Convention sees tepid ratings". Variety. p. 1. Retrieved September 13, 2012. Mendell, David (August 14, 2007). Obama: from promise to power. Amistad/HarperCollins. pp. 272–285. ISBN 978-0-06-085820-9. ^ a b c "Text:Sen. John Edwards Speech to DNC". The Washington Post. July 28, 2004. Retrieved October 20, 2007. ^ "Democratic Convention 2004". The Green Papers. Retrieved April 13, 2008. ^ a b Wilgoren, Jodi; Halbfinger, David (July 31, 2004). "THE 2004 CAMPAIGN: REACTION; Democrats Across the Board Are Pleased". The New York Times. Retrieved January 18, 2010. ^ a b c d e f "'We Have It in Our Power to Change the World Again'". The New York Times. July 29, 2004. ^ "President's Remarks in Springfield, Missouri Remarks". Retrieved January 15, 2010. ^ "No Convention Bounce For Kerry". CBS News. February 11, 2009. Retrieved September 4, 2013. ^ Page, Susan (August 3, 2004). "So why did Bush, not Kerry, get the bounce?". Usatoday.Com. Retrieved September 4, 2013. ^ a b c d e "Boston protests draw police action – politics | NBC News". MSNBC. July 29, 2004. Retrieved September 4, 2013. ^ "THE CONSTITUENCIES: LIBERALS; From Chicago '68 to Boston, The Left Comes Full Circle". New York Times. July 28, 2004. Retrieved September 4, 2013. ^ "Anti-abortion groups lose suit over protests – politics | NBC News". MSNBC. July 26, 2004. Retrieved September 4, 2013.